Location: 190 meters above sea level. Near the golf course. The price of this house is calculated per bedroom, based on 2 persons per bedroom. The 2 individual bedrooms on the ground floor are prepared only for the 7th and 8th person. We have just returned back home after a wonderful holiday week in Villa Cardon. We were a group of 5 people including 2 children (aged 5 and 9). The villa was everything we expected and more. 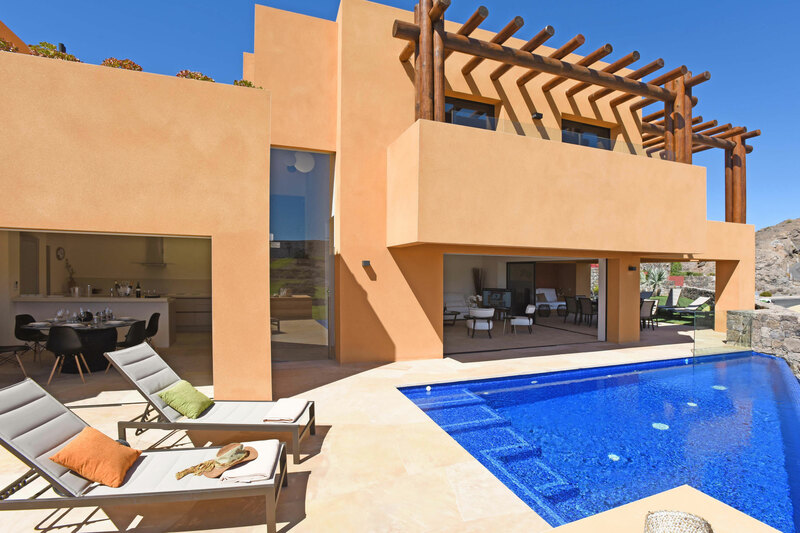 It's in a beautiful location overlooking the Salobre Golf Resort views. Everything was in very good shape and clean. Kitchen was very well equipped making it possible to cook also proper dinners for the family. Also, fresh breakfast bread was delivered to the villa's door every morning - what a nice little luxury service to make also breakfast moments a bit more special. The pool was not huge but big enough for the whole family to enjoy it together. We had ordered the pool heating which made it possible to enjoy swimming later in the evening as well. Overall the terrace and garden worked extremely well for our family and we spent most of our days reading, playing and enjoying the sunny days at our villa. Also location worked well for us because we wanted to have some peace and privacy but still to be close enough (about 10min drive) to some cities, shopping and supermarkets. Own car is needed though to make moving around easier. We also tested out two restaurants in the Salobre Golf Resort area (Sidecar and Casa Salobre) which both turned out to be very good ones. We'll definitely be back for another holiday here! Incredible 4 night stay in a villa surrounded by peace! Although we arrived late in the evening due to our incoming flight from mainland Spain, it was comforting to enter the house with everything (food, toiletries, amenities) so nicely presented and ready for us to enjoy. We definitely appreciated it on our first night when a much needed rest was due. The views from every room were outstanding, and the pool was facing the main golf course, which helps you relax while enjoying a drink. Hopefully this year we will be able to book our stay for more than a week!! Perfect three week vacation. Villa Cardón, is an excellent, well designed and furnished holiday home. There was no lack of detail, lots of crockery, cutlery, glassware ... etc. It felt that I had everything I could need for a long stay, even a Nespresso machine liked the one I have at some. ... Very complete laundry room with an outdoor patio in case you do not want to use the dryer. The stay was pure relaxation. I felt at peace having breakfast at dawn without any feeling of hurry, had time to do some reading and enjoyed the swimming pool. Loved the dynamic of our early afternoon golf games and our dinners watching the sunset on the porch until the moon light was at its peak. Highly recommended!!! Je visite les Canaries depuis des années et ce chalet a été le meilleur dont nous avons profité. Il est nouveau, inauguré fin 2016, aménagé avec beaucoup de goût et sûrement un des plus jolis au Salobre. Le chalet est parfait pour toute la famille, complètement équipé et très bien situé dans une zone tranquille, service privé de sécurité avec accès controlé au resort. Il se trouve dans l’enceinte du club de golf du Salobre et à peu de km des plages de Maspalomas avec ses zones de restaurants et de loisir. On y était très heureux et contents. This place is breathtaking! The house in the middle of the golf court is luxurious, the views to the surrounding are stunning. We had such a delightful experience, having breakfast with such a view and enjoying the infinite pool helped us relaxed and truly felt in holiday mood. We will be coming back!! Wer Erholung und Ruhe sucht hat da er seine perfekte Villa. Grosszügig auf einer Parzelle von 500 m2 gelegen hat sie unsere Erwartungen bei weitem übertroffen. Auch die Aufmerksamkeit der Agentur, sowie des Reiningungsteams muss erwähnt werden. Ein Haus zum Genießen. Viel besser als ein 5*Hotel ! Die Photos von der Villa sind schon beeindruckend , aber wenn man einmal die Aussicht von den Terrassen geniesst ist man noch begeisterter. Die Villa ist mit allem ausgestattet was man sich wünscht und es gibt sogar ein phantastisches Willkommenspaket. Schon zum zweiten Mal waren wir in diesem wunderbaren Haus . Ruhe, herrliche Aussicht, ausreichende Angebot an Restauration wenn man nicht selbst kochen will. Die Villa ist bestens ausgestattet und jeder kann seinen Platz zum Erholen am Pool, auf der Terrasse oder im Jacuzzi finden. Ein Paradies für Golfer und der berühmte Dünenstrand von Maspalomas ist auch nicht weit. Wir haben fast jeden Tag gegolft. Wir kommen wieder!